Family: Canidae Canis lupus familiarisPhoto Wiki Commons, couresty Webweazle. Popular as both a pet and a show dog, the Brussels Griffon is known for being demanding yet highly affectionate! The Brussels Griffon, originating in Belgium in the 1800's. is a toy breed developed from the Griffon d'Ecurie. This breed was crossed with other toy breeds, including the Pug and the King Charles Spaniel, and three distinct Griffon varieties evolved. There is the traditional Brussels Griffon with its long, wiry coat, the Belgian Griffon which has a slightly shorter coat and fringe around its face, and the Petit Brabancon with a short, smooth coat. The Griffons have an attitude similar to that of terriers: they are charming, affectionate, and sometimes stubborn. This breed certainly has a mind of its own, but its sparkling personality has a tendency to win everyone over. They do tend to become attached to one person but will still get along with everyone. They also get along with dogs and cats, but are prone to chasing other small pets. Griffons are highly intelligent, and they can easily learn to do tricks. They make wonderful apartment dogs, and should not be left outdoors for any length of time. When selecting a Brussels Griffon, look for eye problem and slipped stifles. In puppies, look for signs of cleft palate, which will usually require surgery later on if the puppy survives. Breed Type The Brussels Griffon is a toy breed. Known for being demanding yet highly affectionate, the Griffon is popular both as a pet and a show dog. Brussels Griffons are best suited to cool to moderate climates. Background The Brussels Griffon's origins go back to 1800s Belgium. Its predecessor, the Griffon d'Ecurie, was used by coachmen to keep rats out of stables. The Griffon d'Ecurie was eventually bred with other toy breeds, including the Pug and the King Charles Spaniel. 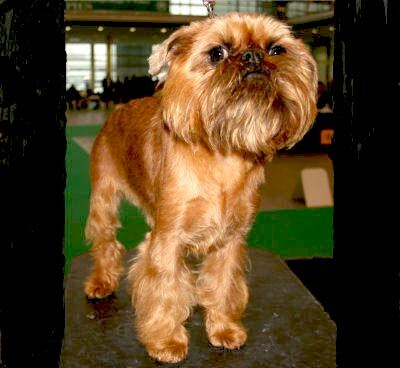 These breeding practices led to the development of three varieties of the Brussels Griffon. The traditional Brussels Griffon has a long, wiry coat. The Belgian Griffon has a slightly shorter coat and fringe around the face. And the Petit Brabancon has a short, smooth coat. Description Brussels Griffons are small dogs with rather squarish bodies and large, rounded heads. The ears are triangular, and are carried semi-erect if uncropped. The ears of show dogs of the breed are usually cropped in the United States. Eyes are large, dark and wide-set. The nose is black, broad and level with the eyes. Brussels Griffons may have wiry, dense coats or short, straight and glossy ones, depending on the variety. Fringe around the eyes, nose, cheeks and chin contributes to the breed's unique look. Colors include red, reddish brown and black, black and tan, and solid black. Both sexes are 7 to 8 inches tall and weigh 6 to 12 pounds. Care and Feeding The Brussels Griffon does well on a diet that includes beef, wheat, and yellow corn, with linseed or wheat germ oil as sources of fatty acids. Rough-coated Griffons require substantially more grooming than smooth-coated ones. The coat must be stripped regularly, especially if the dog is to be shown. Frequent and careful trimming is necessary to achieve the signature breed look, but if kept as a pet, the Griffon's coat may be clipped for easier care. Griffons' tails are usually docked where permitted at 2 to 3 days of age. The ears may or may not be cropped. Griffons shed very lightly, but their short snout may cause them to have respiratory problems. It is advisable to keep dust to a minimum to help prevent breathing difficulties. Housing Your Dog The Brussels Griffon can easily flourish in an apartment. A yard is not necessary. This breed is not well suited to outdoor living, and should not be left outside for long periods of time. Social Behaviors Although Griffons tend to become attached to one certain person, they can get along with the entire family. They need lots of human companionship. This breed also does well with other dogs and cats. It may, however, chase smaller pets. Handling and Training The willful Brussels Griffon may be difficult to train at times, but is very smart. Patience and firmness (but not overbearing) are crucial. This breed can be trained as a watchdog, and is great at doing tricks. Housebreaking may be difficult. Activities Brussels Griffons need little exercise. A short daily walk is sufficient. Be careful not to overwork your Griffon in hot weather, because this can cause respiratory problems or heat stroke. Breeding/Reproduction Griffons tend to have breeding difficulties. They often need Caesarean sections. Litters usually consist of one to three puppies. When selecting a mate for your Griffon, look for eye problems and slipped stifle. Common Health Problems Eye problems are a frequent concern for Brussels Griffons. Common ones include cataracts, lens luxations and glaucoma. Eye injuries are also common. It is important to protect this breed from high temperatures due to its tendency toward heat stroke. Availability Brussels Griffons can be hard to find due to breeding difficulties and small litter size. Prices are often in excess of $1,000.